People a fan of these cars? Not sure, but a conditional 5/5 for 3 that also taps for any color is certainly interesting. 5c Humans interested in something like this? This is pretty good for Standard. But I don't think this is better than Coalition Relic, which doesn't see play. They seemingly forgot to add a built in Sphere effect to this. 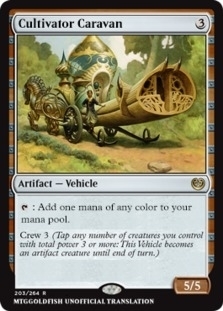 @desolutionist I think this is way better than Coalition Relic, especially in a deck that already has crew for it and would benefit from mana fixing. very intriguing card. Probably not good enough for vintage, but seems like a huge upgrade to every 3 CC mana of any color rocks. Since most of the decks I play are colorless, the card would have been more interesting if it produced Colorless mana to me. So I could cast eldrazi and whatnot under blood moon.